This review is the first of its kind. 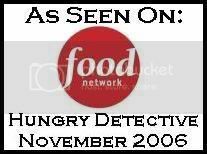 For this review – I am using the help of my Central Texas Affiliate. He and I both visited Health Camp on two different days and ordered pretty much the same thing. This review will combine our collective thoughts on the Health Camp experience. Located on Waco’s famous Traffic Circle just off of I-35 N, The Health Camp, home of the famous ‘Healthburger’, is a Waco legend having served up many a burger, shake, and malt in its many years of operation. The Health Camp contains many of the elements of a quintessential TBG place – family owned and operated, great food, and nothing fancy about it by any means. 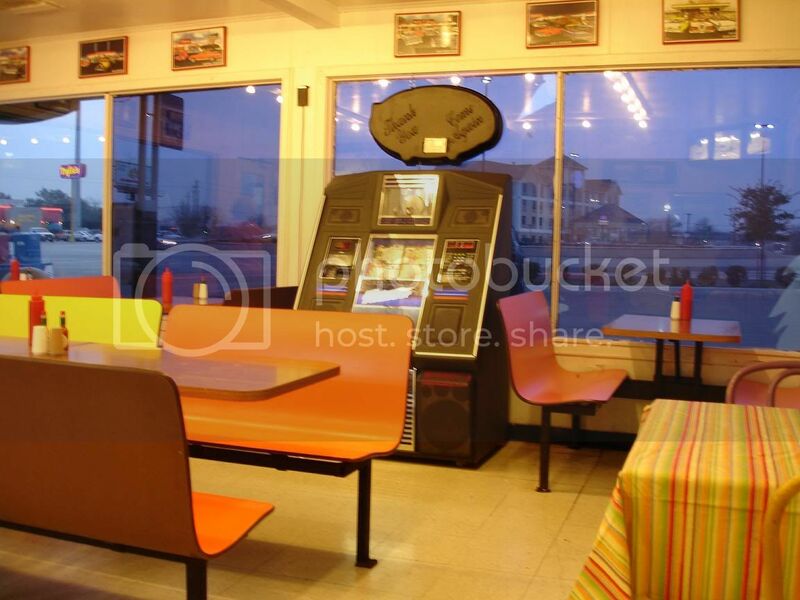 Just good old-fashioned burgers, fries, malts, and shakes made to your liking. For this very reason, even if The Health Camp were to meet its demise someday, it will long live in Waco restaurant lore. Driving up to Health Camp, I immediately got the sense that I was in the presence of something special. This little burger joint has been here for years and years. No place stays around that long without having a little something special for its customers. I was hoping it was the burgers. It turned out that the big draw has to be malts and shakes instead of the burgers. It was with great anticipation that I placed my order for my cheeseburger, fries, onion rings and a strawberry shake. I figured I could use 3000 calories... why the heck not, right?!?! I chose to visit Health Camp during the weekday lunch hour and it was packed which is always a great sign. I dispatched Mrs. TBG to grab us a seat. After a bit of a wait, my number was called and I quickly made my way to the front to retrieve my order. Upon looking at what was on this little plastic tray, I must say I was a little disappointed. It was at that point that I realized why they have a giant ice cream cone on top of the building instead of a burger. The cheeseburger was pretty small. Much smaller than I like. I also discovered, much to my chagrin, that the patty was frozen. That's a huge no no in my book. Nevertheless - I was hungry and ready for a good burger experience. Would I be pleasantly suprised? Would this little bundle of joy pack a mighty flavor explosion in my mouth? All the suspense has to be killing you right? The answer is no it was a complete letdown. If it hadn't been for the shake, fries, and onion rings - I would have been really upset. After reading my affiliates review - we both agreed that the best thing at Health Camp wasn't the burger. The burger from The Health Camp definitely had some Ooze factor to it. However, it was not overly greasy but rather slightly above par with many other burgers I had consumed in recent memory. There was some oooze on the yellow paper it was wrapped in but not enough to score a really high Oooze Factor score. The meat did have a good flavor despite being so small and frozen. The Health Camp burger is a shade on the small side. My affiliate ordered the double cheeseburger and he said it was pretty good sized. Had it not been for the shake and the onion rings I would not have been very full when I left. I didn't have the achy feeling in my stomach like I do when I eat a monster burger. This was just a mild stomach ache so I'm going to give this burger a mediocre Herd Killer rating. At one point during the meal, I realized I was holding the burger with one hand and baptizing an onion ring in ketchup. That translates into a low handling rating as the burger isn't over bulky. My affiliate's double was a little harder to handle but overall - mediocre. 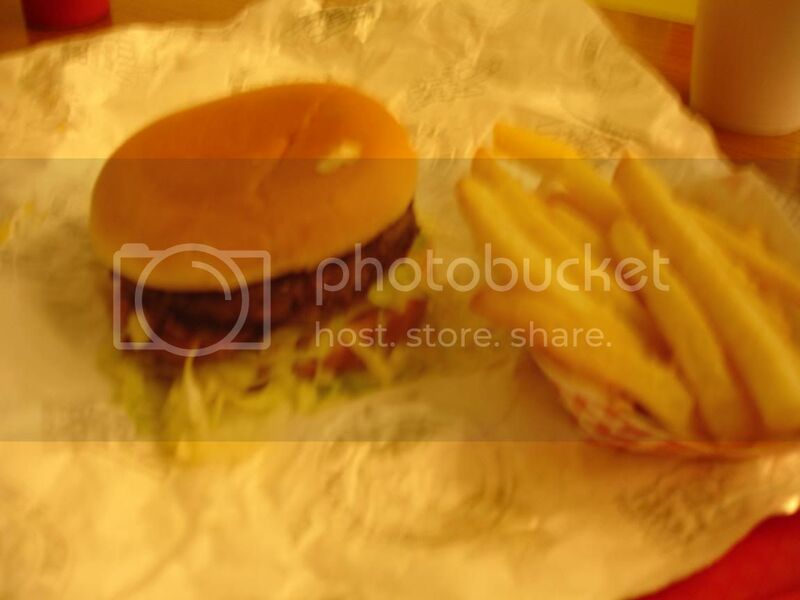 My burger, fries and shake was a little over 5 bucks. That isn't too bad although I wish I had gotten more burger for the buck. If they had slapped down a 1/2 pound fresh burger with that good of a shake - I'd be all over it. 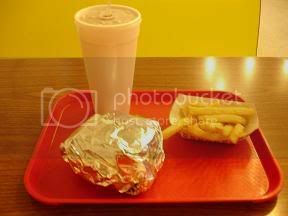 A double with fries and drink runs 6.38 which seems to be a good price for the food your receive. I hate to sound like a broken record, but had it not been for the shake, I would not have had any fears. The shake coupled with the ooozy burger and fries made me only mildly worried about my personal well being. Overall - not really pleased with the burger. It was frozen which is a big no no in my book. It was small - yet another hit from me. It had good flavor and oooze which saved it from being a flop. The onion rings and shakes were awesome. My advice... if you go to Health Camp - order you onion rings and a shake. Eat it and be happy. Don't expect much from the burger. While not flashy, Health Camp gets the job done. It is located in an older building. 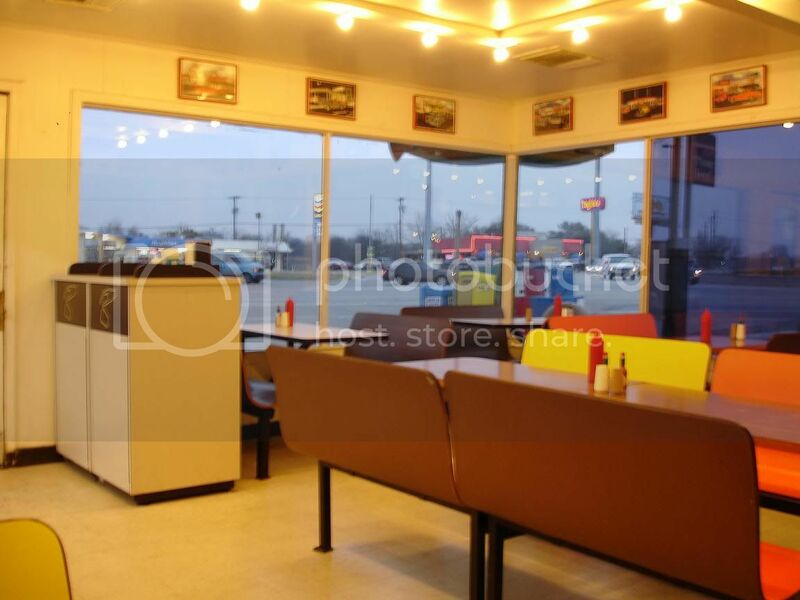 It has a great mom and pops/50’s soda fountain feel to it and a corresponding atmosphere with pictures of it and Waco’s history adorning the walls. It exists on many repeat customers. The staff is friendly and courteous. The fries were marginal, and nothing to write home about. They were clearly of the frozen variety, and not home-made thereby detracting slightly from Health Camp’s overall rating. In addition to burgers and fries, Health Camp serves up a small variety of other foods for customers to choose from. 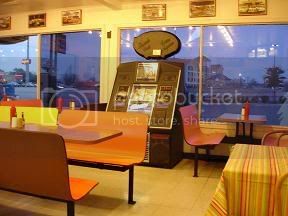 You have your standard hot dogs, and chili dogs, as well as shakes, malts, and other similar type desserts to choose from. The shakes and malts are part of what has made Health Camp famous over the years. Its been said, but my advice is to order up some onion rings and a shake. Health Camp wins big in the restaurant icon category. It's the kind of place that your parents remember from their college days that is still around for you to enjoy during your college days. The people were polite and were generally helpful. It was a good place to hang out with friends and enjoy a shake. Exit Valley Mills Drive off I-35. Go south on Valley Mills towards the circle. Overall, I enjoyed the atmosphere and the history that is Health Camp. Its been around since 1949. That is impressive. With that kind of success - you would expect a great burger. I didn't think they were all that great. I did enjoy the other food I had at Health Camp though. 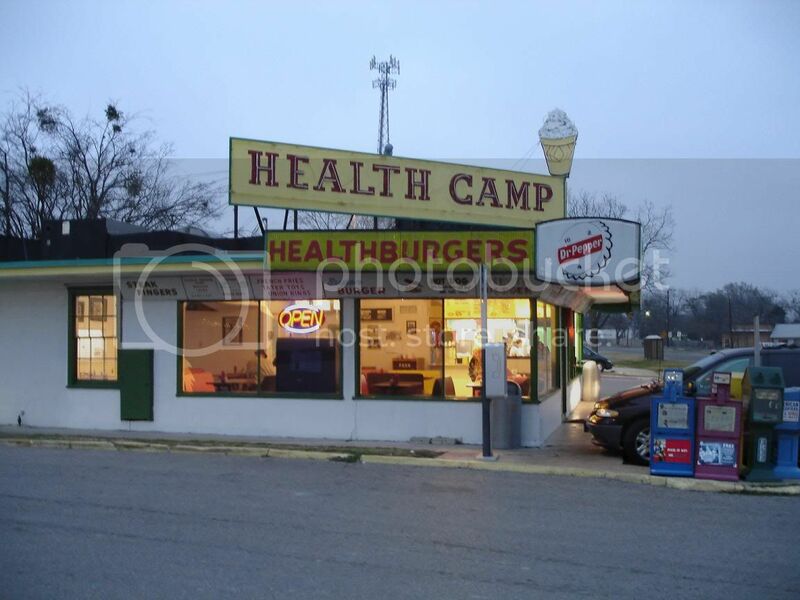 If you are ever in Waco and in need of a little walk down memory lane... give Health Camp a try. Health Camp is known for the shakes not the burgers. I used to eat there a lot with my parents when I was younger. However, I would always order the onion rings and a butterscotch shake - yum! Now living in Southern California eating the famous In N Out burgers.Which are one of the top three burgers,if not the best burger joint here.The only difference between In N Out and Healthcamp is that In N Out is commercial and Healthcamp has the classic feel to it,like you stepped back in time.Healthcamp is highly recommended in all aspects,My opinion, one of the best burgers out there. 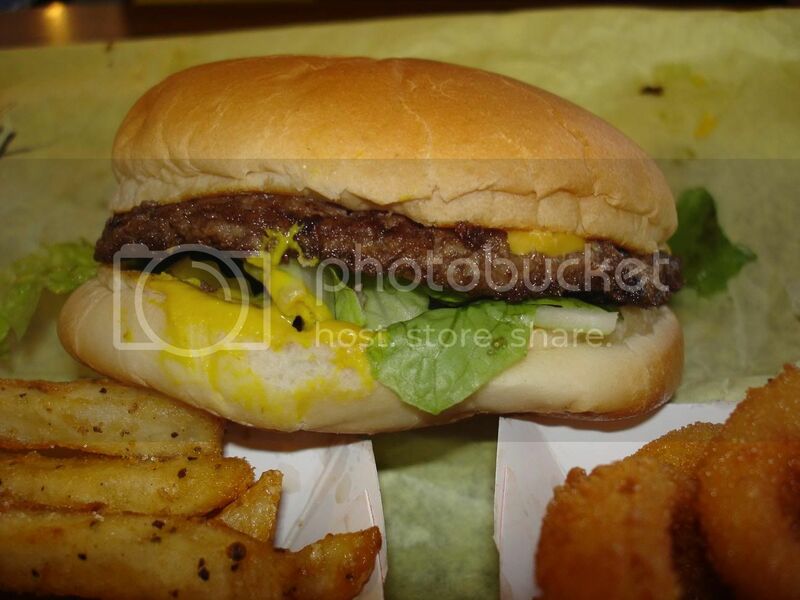 Next time you are in Waco try out Double-R or Kitok's for a better burger experience. Kitok's is known for the liplocker with cheese served with a side of their excellent Oriental fries. The Elite Cafe had better burgers. It was almost next door to it. I don't know if it's still open or not. I used to go to school at Texas State Tech College in Waco. anonymous is correct. I attended Baylor U. for awhile in the early 90's and Kitok's is still a great memory and a great burger. Double Liplocker and Oriental Fries. Delicious. Check it out! Everybody who knows the Health Camp (and I've known it for over 40 years) knows there are two ways to go - the Super Health Burger, which is a double decker similar to a McDonalds Big Mac (in fact, this is the burger McDonalds was shooting for with the Big Mac, but fell far short of the perfection of the SHB), or alternatively, you get TWO cheeseburgers with your fries, rings, malt, shake, whatever. An acceptable alternate to Option 2 (the two cheeseburger route) is to go ONE cheeseburger and ONE chili-cheese-dog. Try Health Camp again, with my time-honored ordering suggestions, and you'll be ready to upgrade your review. Have to agere with Dave in Dallas. You ordered wrong, you have to order the Super health Burger. Best burger there is anywhere, period. 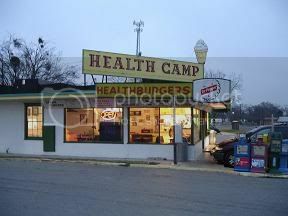 I lived in Waco for 21 years and still go to the Healthcamp for the Superburger when I go home to visit. Best burger anywhere. Wish we had hamburgers like that in Pasadena TX. No mention of Mr. "D" the honorary manager? I was looking at the photos on the wall of him and then looked over and there he was, eating his dinner. Asked him about he photos. Struck up a conversation. Turns out he showed up there on opening day in 1949 after hearing a rumor that Health Camp was a nudist camp. Disappointed, but none-the-less, he has been coming back ever since. What a character. Born in Waco and lived there 22 years thru 1977. Superburger was best burger I ever ate including those I found in Houston and San Antonio. However, recent visits I have noticed changes. Original was 2 qtr lb all beef patties w old english cheese, shredded lettuce, chopped onions, special sauce (like thousand island)and fresh tomatoes on 3 part bun. 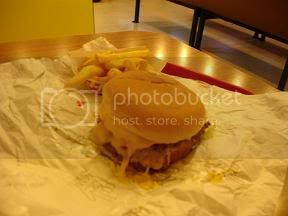 Now it is 2 larger patties w american cheese on 2 part bun and is greasier. Wish they would return to the old recipe. 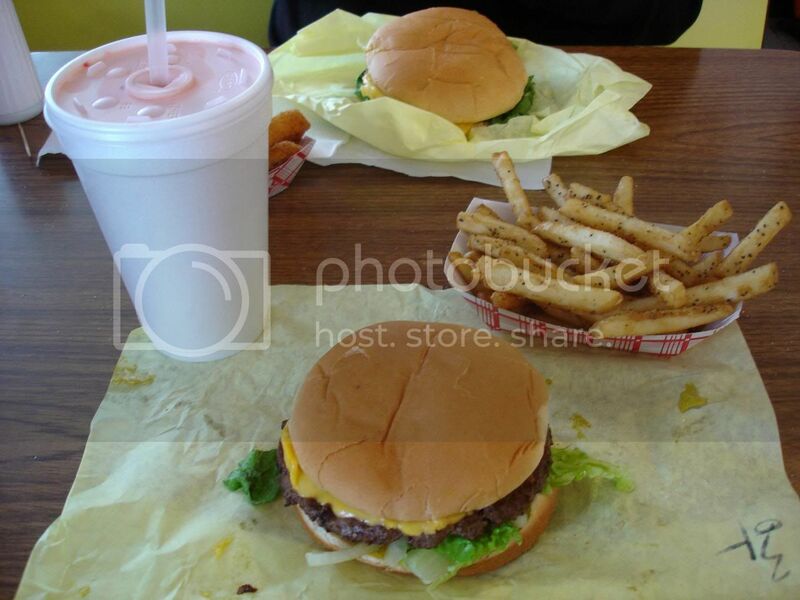 Go to Cupps in Waco for the best burger in Central Texas. Health Camp isn't bad, but you are correct that it is a let down, considering the expectations most people have when they arrive there. But they can shake or malt in any flavor of your choosing. Try the peanut butter malt. Forget the burger at this point because you'll be good for the afternoon. Peanut Butter Malt. You gotta try Sparkle Burger in downtown Houston. It's just NE of the I-45S/US-59N interchange at the corner of Leeland and Dowling street. Huge burgers for 3 bucks. I was in physical pain before finishing the double. Great shakes and onion rings to boot. Call ahead and order in advance if you don't want to have to wait more than 10 mins. Shakes are the health camp thing. Try Britt's Burger Barn on Colcord in Waco. Best ones in town, I'd say with Kitoks second. Britt's gets the edge for the sweet potatoe fries. burgers are the best in the World. eat a slice of Kutchie's World's Greatest Key Lime Pie. listed as "The World's Greatest Key Lime Pie". That was defiantly an understatement! It's been over 6-months now and I can still taste that magnificent pie. Check-out "OUR" favorite burger joint the next time you are anywhere near the hills of Carolina. I'm always late. Today I'm trying to find a place to meet with my friend Tom, when he drives from Austin to OKCity and we drive from Dallas back to Austin, and Health Camp came up as an idea... so I find this post. I've been eating at Health Camp for years as I drive thru from Austin to Dallas, and ate there during a short time of living in Waco in the early 80's. I like thier burgers, love their shakes (butterscotch for me) and their fries. You should really try the hamburgers at Uncle Dan's BBQ. They were originally served at Waco's best burger joint "The Smokehouse". Uncle Dan's has kept the tradition of those great burgers alive. The #5 is fantastic. This burger is going to drip so you need to order it with Fritos to scoop up the mixed cheese, onions, chili, relish sauces and hickory sauce. If you have a larger appetite the #6 just doubles up on everything. My favorite is "The Thing" #9. Basically it's everything. An order of the white potato salad makes a meal to remember. Cupp's!, I've been to the other three waco locations (Dubl-R, Kitoks, Health Camp) you've listed and cupp's has them beat on the burger part of the deal. 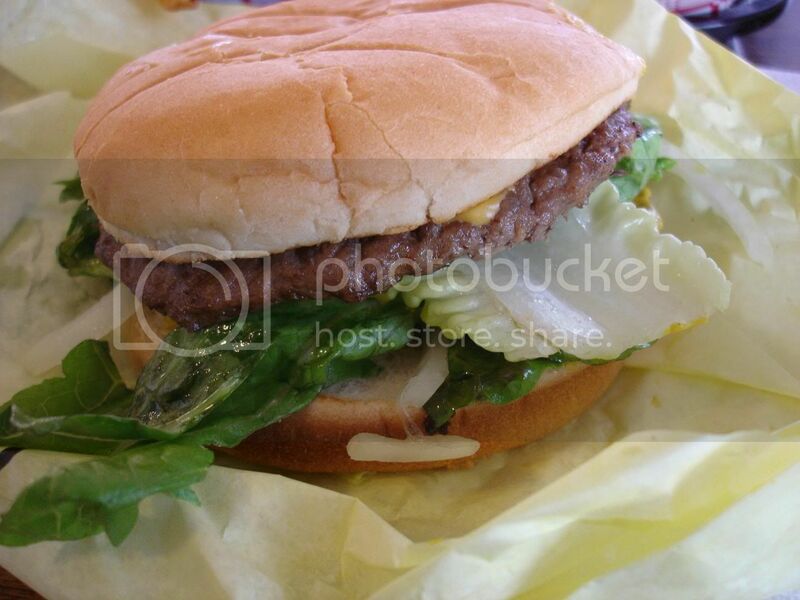 Favorite cheeseburger in the entire state is at Storms drive in lampasas, they also have a location in hamilton. The burgers are definitely a let down and the fries were obviously frozen at Health camp. We were very disappointed. You want an awesome burger?? Try Wolf's in Channelview (Houston). It's located off the Bltw near I10. Little hole in the wall place-best burgers period in Houston!! We just ate there and I was great. Burgers are fresh not frozen. Onion rings were awesome and the burgers were real good especially with the special sauce. went there for a while until a waitress took a wrong order and another one charged me for it. I noticed that she got it wrong, told her, she apparently fixed it, and then charged me again for the right order. But when I checked my bank account: 7.82 + 3.91 for one regular malt with two flavors. dumb asses; they were looking at that half-keyboard like it was sent from mars. Do they still make the Fiesta Burger?